We offer hands-on one-day cooking lessons, or multiple lessons to anyone who wants to learn the culinary tradition of Italy in a fun and friendly atmosphere. We only use fresh products, directly from our garden or from the local markets. Non-participants are welcome to join us. We are easy to reach and centrally located. If you are staying in a hotel, come to us and cook in our delightful kitchens. Upon request, we provide cooking classes onsite at your vacation rental. Based on availability and number of participants, classes are held in different locations. Only steps away from Tuscany, Umbria rivals its neighbor for its uncontaminated natural beauty and offers one of Italy’s most authentic and healthiest cuisines. If you are looking for a unique way to spend part of your vacation, cooking classes are a great way to do it! 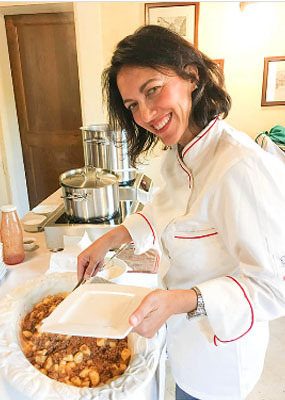 Whether you are an experienced cook or just passionate about good Italian food, learn to cook authentic Italian dishes while in Umbria with these cooking courses, ranging from one-day classes to longer courses that include meals. We guarantee that all participants to our classes will take back home with them the secrets of Italy’s traditional home cooking while enriching their visit with a deeper appreciation of the Italian culture. All our locations are easy to reach and centrally located. If you are renting a property in Umbria, we also offer classes on-site. We will come to your rental villa. We offer hands-on cooking classes in a fun and friendly atmosphere. The classes are offered in English. Non-participant friends & family are welcome to join us for lunch for a small fee.